BLACK Bic Stick Pens sold in increments of 1 Dozen ..
BLUE BIC Stick Pens sold in increments of 1 Dozen ..
RED BIC Stick Pens sold in increments of 1 Dozen. ..
Papermate Black Ink Erasable Pens sold in lots of 1 Dozen. ..
PAPERMATE Blue Ink Erasable Pens are sold in lots of 1 Dozen. ..
PAPERMATE Red Ink Erasable Pens are sold in lots of 1 Dozen. 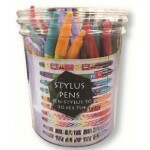 ..
Stylus Pens CLOSEOUT SALE! 50 Pens per Tub. $15 per Tub, a Savings of $7.50 per Tub! ..